Laurie Jury and his ZOKE KiwiMatch team receive the Nations Cup 2011 trophy. Image copyright Sail Sheboygan. Laurie Jury (NZL) and Claire Leroy (FRA) won the ISAF Nations Cup Grand Final Open and Women's division in racing marked by strong winds and big waves in Sheboygan, USA. Sunday's conditions were brisk, with a strong onshore southeast 15- to 18-knot breeze with gusts to 20, and the seas built to 3 to 6 feet, with larger breaking waves roaring through the starting area, putting boat handling at a premium. "I was so impressed with how well the sailors handled the conditions, especially Claire in the final pre-start," said Principal Race Officer Peter Reggio, who also took his fair share of green water over the race committee boat. "It was incredible boat-handling by the sailors in the breaking waves." Claire Leroy (FRA) went 3-0 against Rita Goncalves (POR) in the women's division, sailed in Elliott 6m's. This is the third straight Nations Cup win for Leroy, a first in event history. "We weren't sure how well we would sail, with Elodie recently injured during training in Chicago," Leroy said. "It was important for us to do well in the race, but to win was the cherry on the cake." "It was breath taking, but really demanding conditions. I was very impressed with how well the sailors handled the boats in the rough conditions," said ISAF President Goran Petersson, who watched the final racing on the water. "It is really unique in the history of the Nations Cup to have a three-time winner. Very well done for Claire." Leroy appreciated the rough conditions that may be similar to those found in Weymouth, Great Britain, during the 2012 Olympic Sailing Competition. "We expected the lake to be light air, not like an ocean," Leroy said. "We learned a lot about sailing the boat in heavy weather." Heavy weather picks up the pace of match racing tactics and raises the stakes for penalties, making them easier to incur and harder to clear because the competition stays so close, which were revealed in the final race of the open division. Laurie Jury, Logan Fraser and Michael Edmonds in action at the Nations Cup 2011 Grand Final. Image copyright Sail Sheboygan. With a 2-1 lead going into race four of the open division sailed in Sonars, Jury sailed clean while top-seeded Mads Ebler (DEN) was able to clear his first penalty, but received another at the final top mark during a luffing match. Jury was able to sail ahead to the finish to win. "We are really excited to have won the Nations Cup. It is our first Grade 1 win," said Jury, who is on a match racing streak, winning the U.S. Grand Slam Match Race Series consisting of four grade two events, and gaining entry to the Congressional Cup 2012 by so doing. "It was really tough to get here. 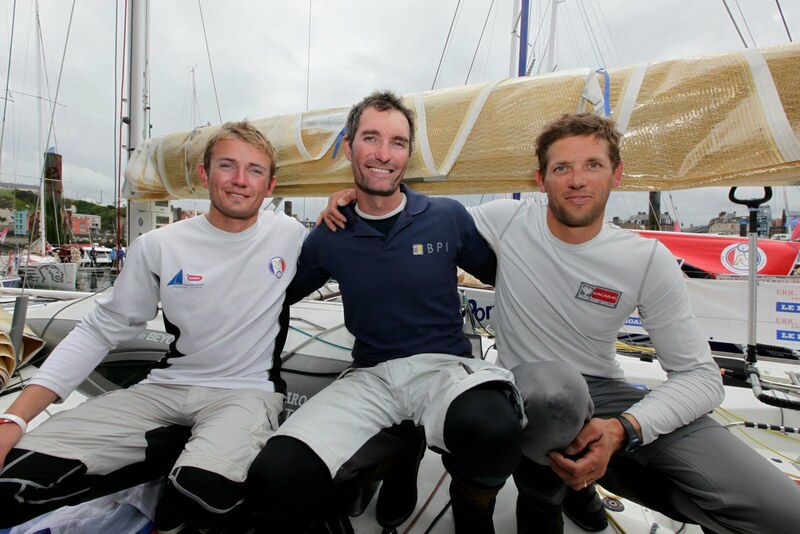 We had to win against the best top-ranked New Zealand and Australia match racers." In the Petit Final for third and fourth place, Olivia Price (AUS) won 2-1 over Mandy Mulder (NED) in the women's division. In the open division, it was Henrique Haddad (BRA) who claimed third place after winning 2-0 against Lucy Macgregor (GBR). "We are very pleased with how well Sail Sheboygan, Sheboygan Yacht Club and the City of Sheboygan prepared for this event," said Henry Menin, Chairman of the ISAF Match Racing Committee. "It was superb conditions, and the equipment held up so well in the challenging conditions. 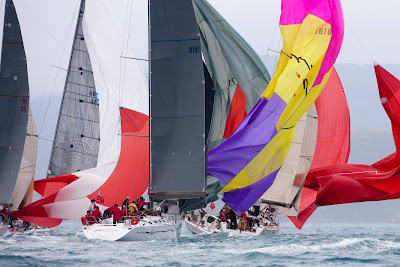 It is an example to other organizations on just how to run a match racing event." "I was very impressed how much the community was able to watch the races. Not many places can do that," Petersson said. "Every one was so nice in Wisconsin. When you come down to it, it is about the people who make a successful sailing program and event." A closing ceremony awarding the Nations Cup trophies was held at Blue Harbor Resort in the afternoon. "We congratulate the winners of the Nations Cup," Sail Sheboygan Executive Director Richard Reichelsdorfer said. "Every race organizer hopes for great conditions and great competitors. We had both." ... also includes footage from Aleph, China Team and ORACLE Racing Spithill. Mother Nature is trying the patience of everyone here at the Knickerbocker Cup this year. Manhasset Bay is known for its fluky winds and variable conditions, but this year the bay as full of surprises. Teams selected for the morning flights faced unstable winds, a lightening storm delay mid-day, and squalls from all points on the bay. But by the end of the day, Race Committee had completed 10 flights and leaders emerged from the mess of weather. Sally Barkow was on fire too. After waiting all morning for the first group of racers to finish their flights, she was loaded for bear. Her first match against front runner Jury was proof of her determination to better her record of past appearances at the Cup. An early penalty forced Barkow to take some serious action. According to Chris Love, Director of Video Production, “As she was leading Jury coming into the windward mark, Barkow luffed up and tried to draw Jury in to either draw a penalty or get him out of position so she could extend to get rid of hers At first Jury was reluctant to engage but then he took an opportunity to go over the top. Sally kept him on the hook, made him tack and then tried to duck his stern, but didn’t quite make it.” Contact! Her bow bumper snagged his back stay which broke when the boats separated. Game Jury. A furious Barkow turned the loss into an intensity that brought her wins for the remainder of the day. She quickly dispensed with William Tiller, Full Metal Jacket Racing (NZL), Nicholai Sehested, TRE-FOR Match Racing (DEN), and Jordan Reece, True Blue Racing (AUS). One of the highlights of the day was the Tiller-Barkow race. Just after rounding the second windward mark beginning the final downwind leg, Sally was about 1.5 boat legs behind and expertly rolled Tiller to windward. The wind fell out of his chute and Barkow blew by him and he couldn’t catch up. Shawn Bennett, Team Bennett (USA) is another team to watch closely. 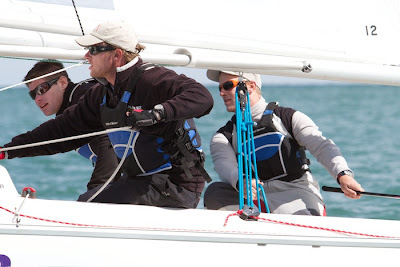 He won an automatic entry into the Knickerbocker Cup this year for his big win at the USMRC at Detroit YC last year. In extremely difficult wind conditions, he managed to pull off four wins with 5 matches during the morning flights. With the thread of a direct hit by Irene, RC is scrambling to finish the Round Robin quickly in the event the Harbor Master closes the bay to all activity. They will try to finish the Round Robin on Friday, but with wind conditions predicted to be light (the calm before the storm?) it will take some magic from Sue Reilly and her committee to get this done. For Reilly, this should be no problem. Many thanks go to Dawn Riley, Executive Director, Oakcliff Sailing Center, for the use of their Swedish Match 40s. Aon Racing made a slow start to the Knickerbocker Cup, with only 2 wins from 5 on the first day of racing. The conditions were extremely variable, with mainly light winds interrupted by thunderstorms and squalls from strange directions. The team was sailing fairly well but simple mistakes cost us several races, making for a frustrating start. Tomorrow we have a long break before getting back on the water for the final 6 flights of the round robin. Hopefully the breeze is good to us because we're told there's a good chance of Hurricane Irene paying a visit during the weekend, meaning the regatta may have to be shortened. Aon racing would like to thank their principal sponsor, Aon Insurance Brokers, as well as Club Marine and Allianz for their support. Thanks also to the Royal New Zealand Yacht Squadron. Aon Racing is Reuben Corbett (Skipper), Adrian Short (Main), Tom Bentham (Trim), Tom Blampied (Pit) and Jay Halligan (Bow). Spanish entry “Telefónica” has turned yet another page in her preparation in the run-up to the Volvo Ocean Race. Following three months of training and preparation at Marina Rubicón (Lanzarote), the yacht skippered by Iker Martínez cast off her lines yesterday afternoon to set course for her next destination: the team base at Sanxenxo, in Pontevedra, Northern Spain. With just two months to go until the start of the round the world competition, a brand new phase of preparation for Team Telefónica has kicked off. Following the time spent in Lanzarote, a weighing up of the experience and what's been achieved and learned by Team Telefónica up until now is unavoidable. “After three months it's clear that coming here was the right decision”, confessed Iker Martínez during his last few minutes in Lanzarote. “The crew have been very happy here and we've also done some really good sailing”. Xabi Fernández, Trimmer on “Telefónica” also looked back over the experience before casting off: “To begin with, these three months have flown by because we've been happy both on the water and on shore. These seas were exactly what we were looking for, with good conditions in terms of wind and the water and we have been able to try out the whole sail program as well as the boat itself. We are really happy, not only because of what we've found here, but also with the feedback we got from the boat. We feel a lot more prepared for this one than we did for the last two Volvos I was involved in. We've sailed a lot, an average of five or six times a week and we have really made the most of being here”. 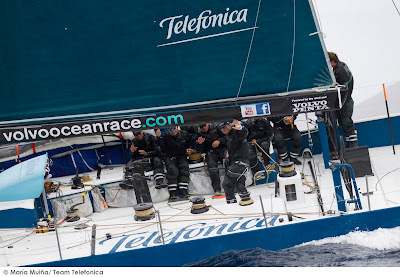 The crew on “Telefónica” are now focussed on what's ahead, as Martínez points out: “Now, rather than looking back at what we have done, we are focussed on what's left to do. Now's the time to think about the next step”. 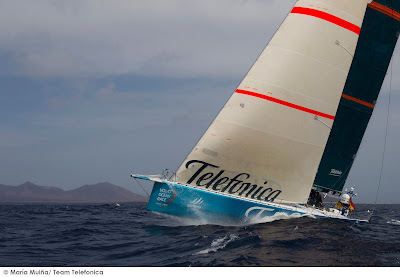 With the yacht in regatta mode, “Telefónica” is now taking on the almost 1,000 mile climb up the Atlantic Ocean, where the course will be mainly upwind, with the wind coming at the yacht head-on. 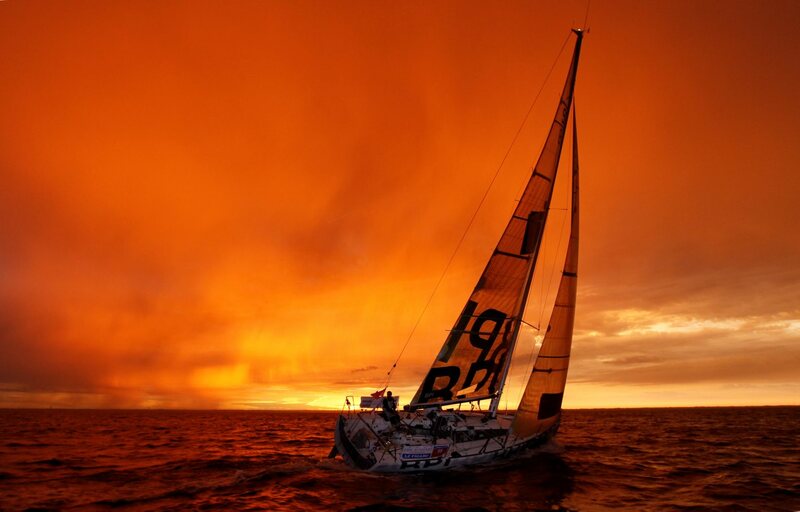 “We will reach the halfway point along the length of Portugal with Northeasterly winds and then we'll get North winds, with four days of pure close-hauling”, said Xabi Fernández. “It's not the most fun sail for us, but it's good for us as here we've been sailing on more open courses. We'll be setting off in regatta mode and we will try to get to know the boat even better. We hope these days will be quick so we can get stuck into the next phase of training in Sanxenxo”, he concluded. The logistics behind a round the world sailing team is anything but simple. 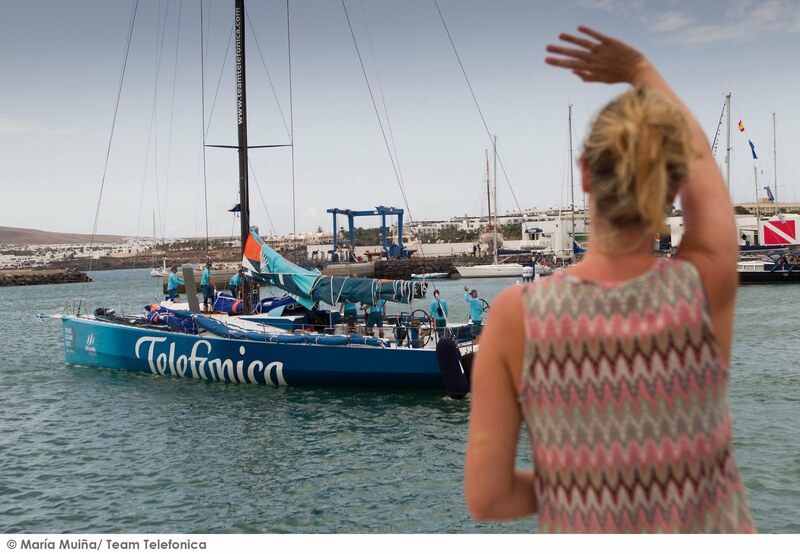 Whilst “Telefónica” and her entire crew are climbing North, the Shore Crew (riggers, sail-makers, boat-builders, electronics experts, purchasing department, logistics crew, etc...) were working hard to dismantle the Team Telefónica base in the Canaries. It's a process that began days ago with the packing of a lot of equipment and finished yesterday. The base, which is made up of various 40-foot containers, other smaller containers which will remain in situ and two tents for the sail loft and the composites and boat-building team, was completely dismantled. A new process will now begin: sending off the containers to Alicante. The 40-foot containers will leave Lanzarote at the end of the month. They'll go from Marina Rubicón to the island's capital Arrecife, where they'll then be loaded onto a ship for Alicante where the Team Telefónica base will then be set up at the port of departure for the Volvo Ocean Race. What will be transported? All of the spares and working equipment, the tools, the team rib (seven metres long), the forklift, each crew and shore members personal items including suitcases, bicycles, surfboards etc., office equipment... Everything bound for Alicante. What about Sanxenxo? A van is travelling to the team base in Galicia with all of the team's baggage. Another van is travelling with any spares the team might need and will be in Sanxenxo when “Telefónica” ties up at the Galician port. The vans are driven by two of the Shore Crew: the “Jorges” (Jorge Blanco and George Peacock). Both started today the long journey across land and sea, a total of almost 60 hours from Marina Rubicón – Arrecife – Las Palmas de Gran Canaria – Portimao – Sanxenxo. “Telefónica” is forecasted to reach Vigo on Tuesday 30th at around 11:30 am, with a stopover of some four hours at the Real Club Náutico de Vigo, the royal yacht club. Another 17 miles will take the crew to Sanxenxo, where they will also be greeted by local authorities and sailing fans. “Both at Vigo and Sanxenxo we'll get a warm welcome, which we are really looking forward to”, said Iker Martínez. 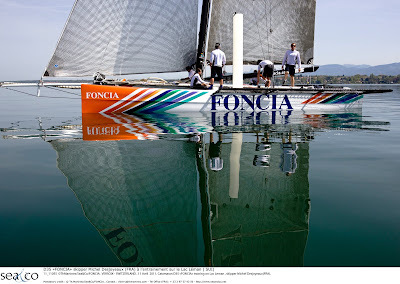 “Sanxenxo is also the Team Telefónica offshore sailing base. It has been for years and it is also where we prepared our round the world BWR challenge and where the Volvo team have been working for a year, so many people are waiting for us and we are really looking forward to being there too”. 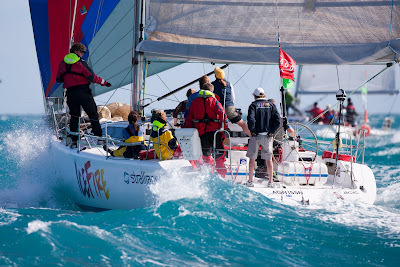 Wild Oats XI. Image copyright Audi/Andrea Francolini. On the penultimate day of Audi Hamilton Island Race Week, two premier divisions have all but been run and won while the rest have one race remaining to make a final grab for points before the curtain closes tomorrow. Conditions were cool on the water today with a 14 knot average south easterly breeze and a top gust of 21 knots and early light showers. With the ocean water whipped up by high winds earlier in the week, whale sightings have been rare however today a mother and calf humpback made an appearance in Whitsunday Passage, breeching as Bob Oatley’s supermaxi Wild Oats XI approached. The line honours order has remained constant all week, Wild Oats XI leading Anthony Bell’s Investec Loyal and Peter Millard and John Honan’s 30m Bakewell White. All three are ramping up for this year’s Rolex Sydney Hobart and valuable lessons taken away from Race Week will be incorporated into their preparation. Melges 32s. Image copyright Audi/Andrea Francolini. Corrected time tells a completely different story with the bigger boats handicapped out of the top spots and a week-long all-in scrap between Stephen Ainsworth’s Loki and the grand prix 50 foot flyers. 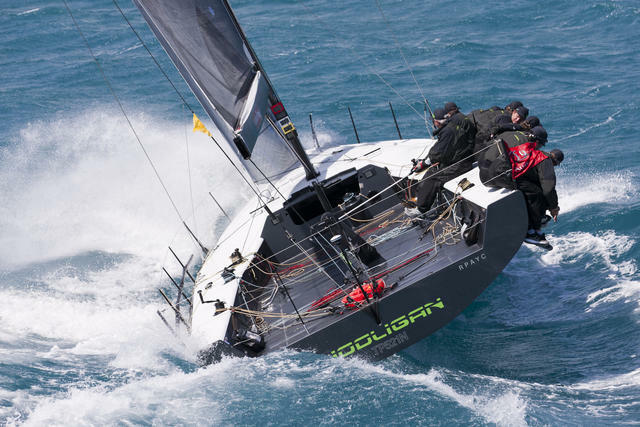 For Marcus Blackmore’s TP52 Hooligan, Audi Hamilton Island Race Week is the culmination of an 18 month long winning program before the boat is shipped to Singapore for the Asian IRC circuit. Following today’s overall win, their seventh from nine starts, Blackmore seems well beyond the reach of his nearest rivals on nine points to Loki’s 19 points. It’s a similar story in IRC Class B, Darryl Hodgkinson’s Beneteau 45 Victoire five wins, two seconds and today’s third setting them up for a call to the stage at tomorrow evening’s official trophy presentation. M32 Lumix. Image copyright Audi/Andrea Francolini. In the remaining divisions the competition is far from over, particularly in Performance Racing Division 2 where just two points separate the first six boats on the results sheet. Ice Racing. Image copyright Audi/Andrea Francolini. 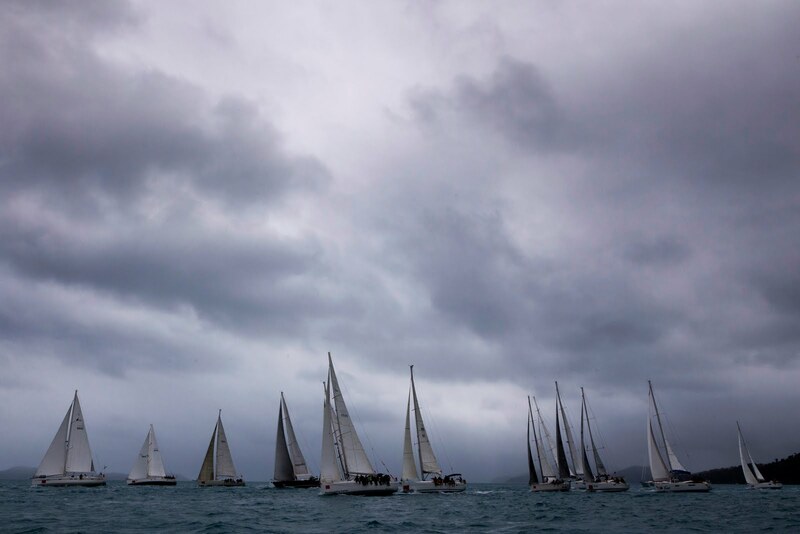 Audi Hamilton Island Race Week’s concluding on water event is the Molle Islands Race, kicking off from 10.30am tomorrow morning from Dent Passage. San Diego layout. Image copyright ACEA. In under three months’ time, the America’s Cup World Series will land in San Diego for the U.S. debut of the new look America’s Cup racing. A new professional global circuit, the AC World Series features the sport’s best athletes competing on some of the most physically demanding boats in the world - the AC45 wing-sailed catamarans. Adding a new and exciting chapter to its storied history with America’s Cup, San Diego is renown as one of the best sailing venues in the world. But come this November, San Diego will see a very different America’s Cup experience, with racing held just feet offshore, live inside San Diego Harbor in front of thousands of spectators. As one of the real birthplaces of extreme sports, San Diego is an ideal host for the next generation America’s Cup, with boats that really embrace the extreme. “We spent 16 months in San Diego preparing for the last America's Cup, so we know that the harbor is a perfect stadium for the new-look high-speed, high-energy America's Cup,” said James Spithill, Skipper of ORACLE Racing. “We thought it was pretty cool just sailing our wing-sailed multihull back in 2009, but this time there will be a whole fleet sailed by teams from around the world. I can promise you this: people in San Diego will have a new appreciation for America's Cup sailing." 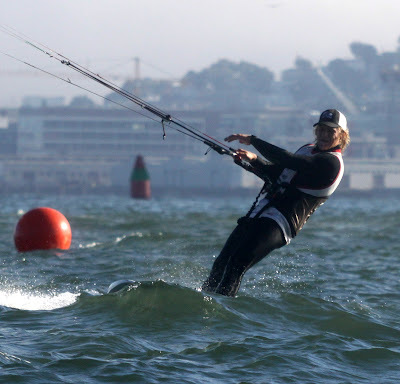 The AC World Series San Diego event will take place inside San Diego Bay, with numerous waterfront viewing locations that will allow spectators to see the on-the-water action up close. In addition to a full race schedule, the series stop will feature the all-ages AC Village at Harbor Drive which encompasses activities on Broadway Pier and the U.S.S. Midway with spectator grandstands, interactive displays, concession booths and a nightly entertainment schedule, while the stylish AC Experience at Harbor Island will provide a more lavish setting for patrons. Fans will be greeted by new boats, new formats and a whole new level of racing. Sailing the AC45, the athletes will tested through both fleet and match races that put a premium on physical and mental strength. The highlight of the event is winner-takes-all, fleet race on Sunday November 20, where the teams will compete for the title of AC World Series San Diego Champion, as well as the chance to put points on the board for an overall 2011-12 AC World Series win. Another fan showcase – the AC 500 Speed Trial, where teams push their boats to the limit to cover a 500-meter straight-line course in the shortest time. "San Diego Bay has a proven track record as a perfect venue for this type of action-packed sailing," said Lou Smith, Vice Chairman of the Board of Port Commissioners. "The port supports the America's Cup World Series as part of its goal to 'activate' the waterfront around San Diego Bay, providing economic benefit to port tenant businesses and enjoyment to spectators." Broadcast to expose millions more fans to the sport of high-performance sailing, the AC World Series is a regular circuit of regattas that will bring America’s Cup-level racing and experience to top international venues. The AC World Series champion will be crowned during the final circuit stop in Newport, RI, in 2012. The AC World Series events provide the fans the only opportunity to see all of the America’s Cup competitors racing together. 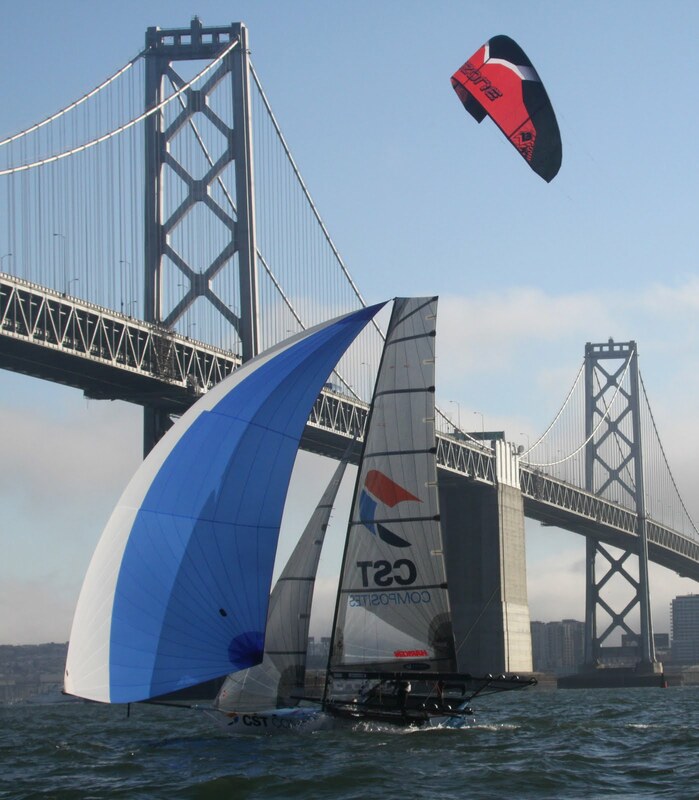 The AC World Series is sailed in the AC45, the forerunner to the next generation of America’s Cup boats. Focused on creating more on-the-water excitement for both the teams and the fans, the AC45 wing-sailed catamaran was designed for both speed and close racing. While capable of closing speeds of over 35 mph, the AC45 remains nimble enough to handle the tight, tactical race courses planned by America’s Cup Race Management. The new format of the America’s Cup also includes a strong commitment to restoring and preserving the world’s oceans through a partnership with Sailors for the Sea and other organizations at each series stop. Multiple Laser world champion and Rolex ISAF World Sailor of the Year Tom Slingsby has been part of many different race programs. When asked what he believes is the magic ingredient, the explanation for Marcus Blackmore’s mind boggling success at Audi Hamilton Island Race Week with his TP52 Hooligan, Slingsby says it’s the team. “Sometimes the volume goes up but it’s always constructive. There is never a harsh word spoken to a crewmember, no one gets attacked,” he says. There’s no doubt Blackmore’s boat is fast, damn fast, and boasts an enviable line up of yachting superstars who are being coached by one of the best, Australian Olympic coach Victor Kovalenko. Including today’s two windward/leewards, Hooligan has recorded six wins and two seconds to be on eight points in IRC Class A Grand Prix Division, stretching away from the nearest boat, Stephen Ainsworth’s RP63 Loki on 14 points with two races remaining. Hooligan is also holding firm in the Audi IRC Australian Championship which will be decided at Race Week, leading Class A on three points from Stephen Ainsworth’s Loki on six points and Michael Hiatt’s Living Doll on seven points. In Class B of the Championship, Darryl Hodgkinson’s Victoire is leading comfortably on four points well clear of Rob Reynolds’ Exile on 10 points and Paul Clitheroe’s Balance on 11. In Class C of the Audi IRC Australian Championship Peter Sorensen’s Sydney 36CR The Philsophers Club is leading on six points from Andy Kearnan’s L’Altra Donna on nine points and Andrew Hurt’s Onya on 17 points. Hooligan, Rob Hanna’s Shogun and Loki are staging a three-way tussle for the major Race Week placings, holding out the other players including Hiatt’s Living Doll and Jim Farmer’s New Zealand Botin & Carkeek design, racing with America’s Cup sailor Chris Dickson aboard. Hooligan. Image copyright Audi/Andrea Francolini. 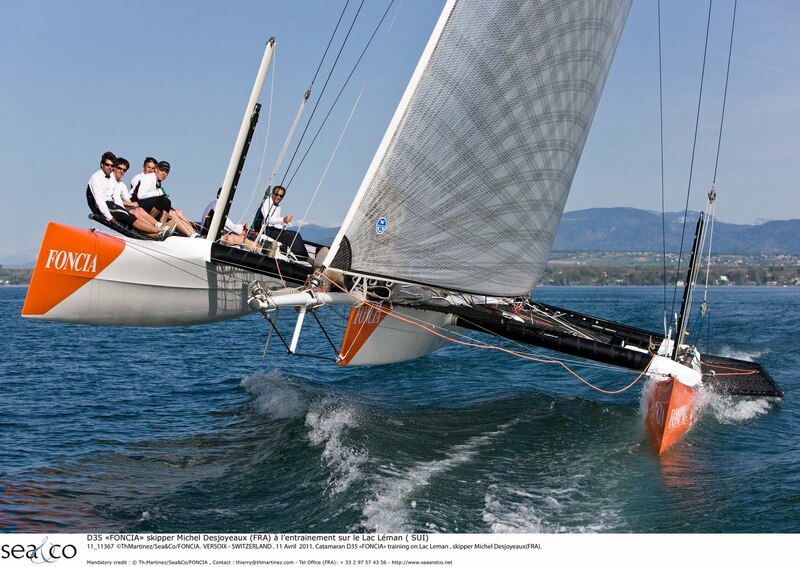 The Melges 32 Sports Boats Division at Race Week is one design racing at its best. Noel Leigh-Smith’s Desperado from Southport Yacht Club is the new clubhouse leader after today’s long race, ousting Stephen Girdis’ Funnel Web from the top spot. Desperado’s tactician “when it’s going right” Phil Kellond-Knight from the Gold Coast admits “the afterguard is fairly ancient” and at this point of the week they are starting to hurt given the physical nature of the class and the testing conditions. “We go to the Tavern at night and tell a few lies then go home to bed,” said Kellond-Knight. Amazingly Desperado, a brand new Melges 32, only arrived in the country last month giving the crew just two opportunities for some training on the Gold Coast Broadwater before trucking the boat to Hamilton Island where they are just one point out in front with two passage races to be sailed. Today's forecast is for abating E/SE 10/15 knot winds and decreasing seas with scattered showers. Tomorrow, for the final day of Australia’s most awarded sailing regatta winds are likely to swing to the NE/SE at 10-15 knots and decrease, hopefully just enough breeze to get the 195 competing boats around the track in the Molle Islands Race before the series runs out of puff. On departing Hamilton Marina and entering Dent Passage those vying will turn immediately to starboard and cruise past the Flag Deck of Hamilton island Yacht Club, as close as possible without running aground. 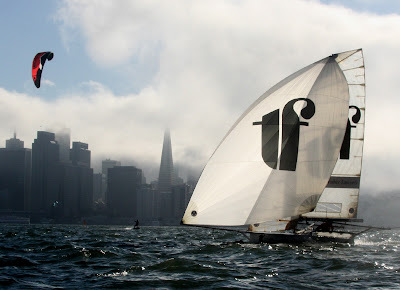 Fog and wind are served up like hors d'oeuvres on San Francisco Bay, but this week has seen too much of the former and too little of the latter to suit a serious sailor's taste. Nevertheless, hometowner Bryan Lake and Michael Coxon of Australia gulped it down with satisfaction Thursday in the Ronstan Bridge to Bridge Race woven into the 10th annual 18ft Skiff International Regatta hosted by the St. Francis Yacht Club. Lake, a kite boarder, was the first finisher by far among a diverse fleet of kites, 18ft Skiffs, a bunch of sailboarders and even a small catamaran that struggled home last. His time over the 7 1/2-nautical mile course from the Golden Gate past the city to the Bay Bridge was a commendable 17 minutes 56.15 seconds, comfortably ahead of the 18s that had won the race the last three years. America's Howie Hamlin, New Zealand's Alex Vallings, Australia's Nick Press and Australia's John Winning followed closely in that order. Winning, the week-long leader, won the day's regular 18s race on the windward-leeward course, but fifth in the Ronstan lifted Hamlin from a point behind him to a point ahead after 8 of 10 races. "We still have two races to go," Hamlin said. "We've had some unusual conditions [including] the most fog I can remember ever sailing in here." Winning held the Ronstan lead briefly until Coxon and Hamlin slipped by from farther outside on the turn past the city. Coxon, who sat out the first three days of racing with a neck injury, showed up Thursday morning fit to go well before race time. The veteran Trevor Barnabas gladly handed the tiller back to the countryman who last year garnished his regatta triumph with a win in the Bridge to Bridge classic. "A little time in Napa Valley did a lot of good," Coxon said. With a day off Wednesday, Coxon was among 20 sailors who chartered a bus to visit the nearby California wine country. Another familiar face, that of Mike Martin, was aboard Panasonic with skipper Jonathan Whitty. Martin crewed for Hamlin in four of his five wins in this regatta and is now, officially, Director of Umpiring and Rules Administration for America's Cup Race Management. 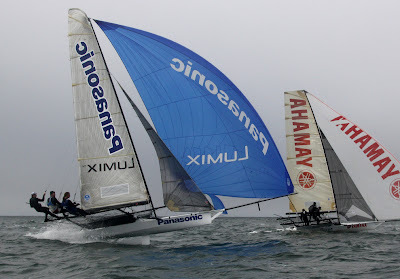 He was just in Cascais, Portugal for the first America's Cup World Series tune-up competition. 1. Yandoo, Australia, John Winning/David Gibson/Andrew Hay, 1-2-3-2-3-(5), 11 points. 2. CST Composites, USA, Howie Hamlin/ Matt Noble/Paul Allen, 2-3-1-(5)-5-1, 12. 3. Thurlow Fisher Lawyers, Australia, Michael Coxon/Aaron Links/Trent Barnabas, 7-1-6-1-(16/OCS)-2, 17. 4. SLAM/Mounts Bay WA, Australia, Grant Rollerson/Justin Healey/Marco Schuermann, (11)-5-5-3-1-4, 18. 5. CT Sailbattens, New Zealand, Alex Vallings/Chris Hiller/Josh McCormack, (6)-6-4-4-2-3, 19. 6. SMEG, Australia, Nick Press/Daniel Phillips/Brant Demis, 3-(7)-2-6-6-6, 23. 7. Maersk Line, Australia, Graham Catley/Nick Catley/Riley Dean, 4-(9)-7-9-4-8, 32. 8. Harken, Australia, Glenn Raphael/Ben Lawrie/Matt McKinlay, 8-4-11-7-(16/OCS)-7, 37. 9. Yamaha, New Zealand, Dave McDiarmid/Andrew Archibald/Chris Burgess, 5-10-9-(11)-8-10, 42. 10. White Lightning, USA, Patrick Whitmarsh/Charlie Smythe/Mark Breen, 10-(12)-10-8-9-9, 46. 11. Panasonic Lumix, Australia, Jonathan Whitty/Mike Martin/James Hozack, 9-8-13-10-7-(16/DNF), 47. 12. O'Canada, USA, David Rasmussen/ John Gray/Trevor Bozina, 12-(14)-12-13-11-11, 59. 13. USA Black, USA, Skip McCormack/Jody McCormack/Polish Mike, 15-13-8-(16/DNF)-10-16/DNF, 62. 14. Death Dealer, USA, Brian Malouf/John Gilmour/Joe Penrod, 13-11-14-12-13-(16/DNF), 63. 15. Love Machine, USA, Chad Freitas/Katie Love/Daniel Roberts, 14-(16/DNF)-16/DNF-16/DNF-12-16/DNF, 74. Zwei letzte Plätze werfen das deutsch-französische Audi Sailing Team powered by All4One weit zurück. „Container“ als Vierte und Dritte verbessert. Einheimische „Bribón“ übernimmt Führung in Cartagena. Super-GAU, der größte anzunehmende Unfall – anders kann die Tagesbilanz von Jochen Schümann am Donnerstag (25. August) nicht ausfallen. In beiden Segelwettfahrten der vierten Regattaserie des Audi MedCups in Cartagena/Spanien belegte der zweimalige America’s-Gewinner mit seinem Audi Sailing Team powered by All4One (Kiel) nur den letzten Platz. In der Gesamtwertung übernahm das deutsch-französische Projekt die rote Laterne von der „Container“. Die TP 52 von Udo Schütz aus Selters zeigte sich nach verpatztem Auftakt verbessert, ist nach den Einzelrängen vier und drei jedoch vorerst sechs Punkte hinter der Spitze nur Vorletzte (6.). Die „Bribón“ der Gastgeber glänzte mit einem hauchdünnen Tagessieg im dritten Rennen und übernahm die Gesamtführung einen Zähler vor der russischen „Synergy“. Positiver fiel die Zwischenbilanz der „Container“-Crew aus. „Wir haben zwar immer noch leichte Speedprobleme, aber es ging schon deutlich bergauf“, sagte der Berliner Frithjof Kleen, der von Skipper Markus Wieser als Coach geholt wurde. „Zwei Super-Starts und keine große Fehler auf der Bahn haben uns zwei Mittelplätze eingebracht“, so der Starbootsegler weiter, „damit müssen wir zufrieden sein.“ Zwar hatte die US-amerikanische „Quantum Racing“, Gegner Nummer eins im Kampf um den Saisonsieg im Audi Med Cup Circuit 2011, zunächst das bessere Ende für sich und zog in Lee der Deutschen langsam vorbei. Doch im zweiten Tagesrennen gelang die Revanche, als Ed Baird das US-Boot nur auf den vorletzten Platz manövrierte. Die schwierigen Windbedingungen spiegelten sich auch zum Auftakt der Soto 40-Regatta wider. Der Auftaktsieg ging an die einheimische „NH Hotels“, während die sonst haushoch überlegene „Iberdrola“ nur Vorletzte vor der „cruiser-racer.com“ (alle Spanien) wurde. Die deutsche Taktikerin Sabine Schumann aus Barcelona musste auch im zweiten Rennen der Erfahrung der Gegner auf diesen neuen Booten Tribut zollen und war mit ihrer Mannschaft abgeschlagen. Die Gesamtführung übernahm überraschend die britische „Ngoni“ mit einem Tagessieg nach Rang zwei zu Beginn. Die Region of Murcia Trophy im Audi MedCup wird am Freitag (26. August) mit zwei geplanten Wettfahrten und – wenn möglich – einem Nachholrennen der TP 52 fortgesetzt, das am Mittwoch mangels Wind ausgefallen war. Die letzten Rennen finden am Sonntag (28. Juli) statt. From a second day of light winds racing off Cartagena, SE Spain, the Spanish TP52 Bribon emerged with a slender overall lead at the Region of Murcia-Cartagena Trophy regatta after they held their nerve to win the second race of the day. In the Soto 40 Class Kevin Sproul (GBR) and the crew of Tony Buckingham’s Ngoni (GBR) lead after two races after scoring a second then a first place. Patience has been a key virtue so far: not just for dealing with the long postponements waiting for the fickle minded sea-breeze to fill out enough to allow racing, but in the judgement calls required to decipher what the shifting, unsettled breeze is doing. After a fifth then a race win, adding to their second place on the opening day, 2008’s winners here Bribon top the regatta standings by one single point ahead of Synergy’s Russian Sailing Team. But the Spanish crew might have been further ahead on the results table were it not for a costly penalty during the second beat of the first race. Infringing Quantum Racing (USA) dropped them from second place to finish fifth. The gentle sea breeze was slightly stronger than for the 52 Series first racing day, but it still never made more than 10kts. There was little in the way of a solid wind pattern from one leg to another. In the first race Italy’s Audi Azzurra Sailing Team won from the left, pin end of the start line to work the offshore side of the course, finishing ahead of Circuit leaders Quantum Racing. In the second race Bribon’s double Olympic medal winning tactician Ross MacDonald (CAN) did an astute job of keeping them in the best pressure and they were just able to hold off Niklas and Catherine Zennström’s RÁN (SWE) to win. Consistency over both races proved especially elusive, the Italian crew on Audi Azzurra Sailing Team scoring best for the day with their 1,4. The Soto 40 fleet’s first experience of racing on this testing arena was no easier, but the closely matched fleet did have what must rank as their closest and most tactical day of racing yet in the lighter breezes. In place of the physical demands of controlling these light powerful one designs the key gains were made off the start line and making best use of the wind shifts. 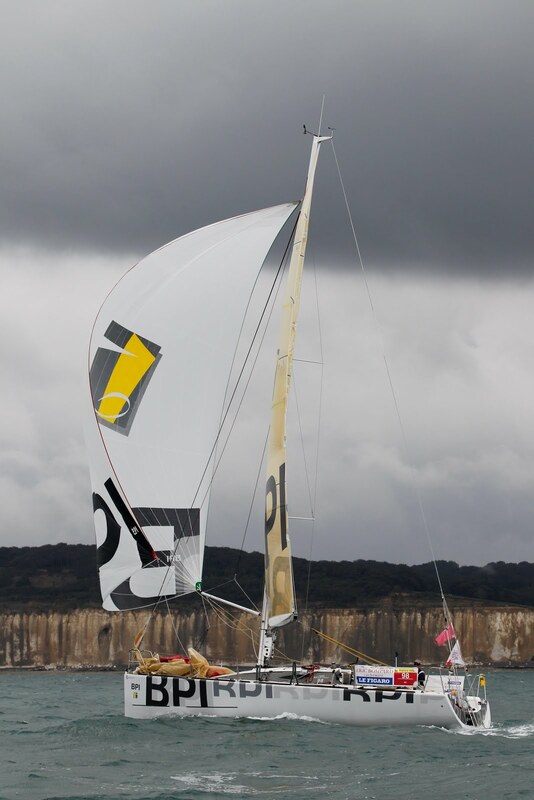 After the young Australian Team on Patagonia by the Australian Soto 40 Team had lead since the first run Inaki Castaner (ESP) and the crew of NH Resorts (ESP) (aka Noticias IV) were able to take the lead in the dying minutes of the last run. As Patagonia tried to hold up Circuit leaders Iberdrola (ESP), they opened the door for Ngoni to steal second at the other end of the finish line. NH Resorts and Patagonia by the Australian Soto 40 Team both jumped the start gun in the second race which was won comfortably by Sproul and the Ngoni team who lead the regatta by one point from NH Resorts. “ The boat performs very well in these conditions. In the first race we fought against Azzurra and Quantum but in a port-starboard situation they were on port and made us hesitate and we ended up being penalized. No objection, it was a mistake from our side, but we left that behind and we managed to save the day. In the second race we were among the top boats from the beginning. On the last run we had RÁN ahead but we caught them and that makes us leaders in Cartagena". “ A fourth and a first place is a nice score. In the first one we did things well, we started well and went to the left. We were in control from the beginning, Quantum was behind sailing very fast and were kind of threatening but we coped with it and won the race".
" We did a good start in the race we won. Our tactician Gustavo Martínez Doreste did a good job, and also the rest of the crew, which sailed at their best inspite of all the shifts and preassure differences. The keys today were consistency and good tactics, you had to choose one side or the other. In this conditions you can't lose concentration". Victoire. Image copyright Audi/Andrea Francolini. In the hard-fought IRC Class B at Audi Hamilton Island Race Week, Darryl Hodgkinson’s slippery Beneteau 45 Victoire has padlocked the top placing and thrown away the key with today’s fifth consecutive handicap win from six starts. An island course in a gusty 18-20 knot SE breeze proved another easy hit out for Victoire which is demoralising its Class B competition. Hodgkinson, a Sydney based plastic surgeon, and his Cruising Yacht Club of Australia team pre-planned their season well in advance. They have put significant effort into boat maintenance and their sail wardrobe as well as time on the water to gel the crew. There’s no doubt tactician and the linchpin Hodgkinson describes as “a magician on the helm downwind in 30 knots plus”, Sean Kirkjian, has been instrumental in the boat’s success which so far includes divisional wins in the Audi Sydney Gold Coast and Meridien Marinas Airlie Beach Race Week. Now a win at Audi Hamilton Island Race Week is at their fingertips. 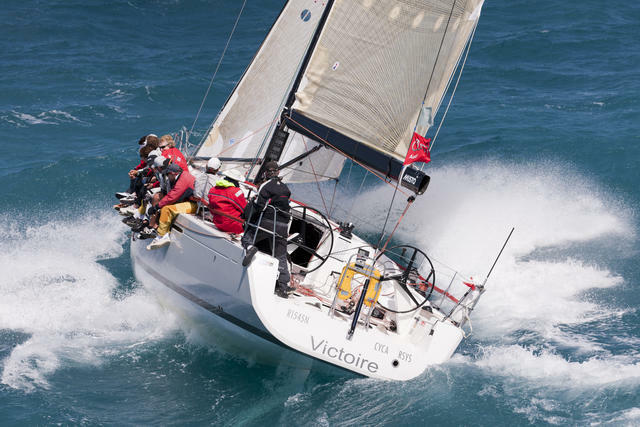 Guest crew aboard Victoire for this week include Ros Urwin and 16 year-old Kristie, the wife and daughter of the Royal Ocean Racing Club’s rating director Mike Urwin, who is part of the Race Week jury. Sistership Paul Clitheroe’s Balance was today shuffled out of second place by Ray Roberts’ Evolution Racing, the two tied on equal points with two races remaining. “Because ours is a sistership to Victoire the tragic truth is we can’t blame the boat,” laughed Clitheroe today on the dock. Beneteau designs make up a quarter of the almost 200 strong fleet enjoying the 28th edition of Audi Hamilton Island Race Week. Ross Wilson’s First 47.7 Eagle Rock is second on the Performance Racing 1 pointscore on a countback while the all Japanese crew on Kiwamu Takahashi’s chartered First 40 Chancellor is runner up in Performance Racing 2 by a slim one point margin. A very different looking Beneteau, a mini version of the Open 70, has made its Australian regatta debut at Race Week. Gold Coast owner Paul Laurence was a cruising sailor who was in the market for something sporty. He put in his order last November for the new generation Beneteau First 30 in May this year and just prior to the Sanctuary Boat Show it arrived and immediately went on display. Called G2, Laurence’s First 30 is one of only two in the country. It found early success club racing out of Southport Yacht Club in light conditions. At a windy Race Week Laurence and his crew are still finding their feet in Cruising 2 Division of the wide, snub nose sports boat design. “My first impression is that it’s a fantastic boat, a weapon,” said the delighted skipper today. The design, which measures 9.52m in length and 3.2 in hull beam, includes a wide open cockpit, twin transom hung rudders and mast that’s aft to create a larger triangle so the mast doesn’t have to be too tall or the keel too deep. “The boat actually enjoys being over on its ear....the crew don’t mind this either.... and the leeward rudder stays vertical. It’s also a very dry boat,” added Laurence. With the breeze trending down after a blustery start to Race Week, Laurence is looking forward to tomorrow’s island course and Saturday’s final Molle Islands Race to gauge G2’s potential in more moderate conditions. Designed by the talented Juan Kouyoumdjian, well known from the America’s Cup and the VOR, and technical advisor Michel Desjoyeaux, the First 30 has made a spectacular comeback more than 30 years after its predecessor. left to right: Tom Ehman, Jimmy Spithill and Bob Oatley, with the America's Cup and the Admiral's Cup. Image copyright Audi/Andrea Francolini. For the first time ever, two of the most significant trophies in the sport of sailing, have been displayed together. The America’s Cup and the Admiral’s Cup are on show this week at the Hamilton Island Yacht Club. The oldest trophy in the history of international sport, the America’s Cup, arrived on Hamilton Island yesterday afternoon. The cup flew to Australia from San Francisco in a first-class passenger seat. The visit coincides with the 160th anniversary of the first awarding of the Cup in 1851. This is only the third time that the Cup has been seen in Australia, so its presence at Audi Hamilton Island Race Week is high recognition of the stature that this regatta now holds on the international sailing scene. The Admiral’s Cup is currently defended by Australia and Sydney’s Royal Prince Albert Yacht Club after Bob Oatley’s yacht Wild Oats won it in 2003. Last night, at sunset, at the Hamilton Island Yacht Club, both Cups were revealed from their travelling boxes. “The America’s Cup travels in a very large Louis Vuitton box which captures great attention at the airport,” said Vice Commodore of the Golden Gate Yacht Club Tom Ehman who travelled to Australia, with the Cup and two security officers. Hamilton Island Chairman Sandy Oatley said it was one of his life’s pleasures to have both of the Cups together on the island. “We are extremely honoured to have the America’s Cup at Audi Hamilton Island Race Week,” he said. 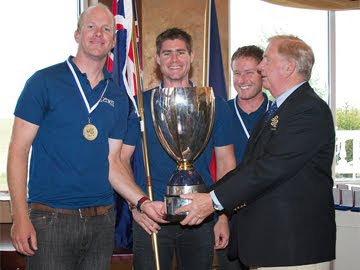 Bob Oatley, Jimmy Spithill and Iain Murray with the America's Cup. Image copyright Audi/Andrea Francolini. The America’s Cup is currently held by San Francisco’s Golden Gate Yacht Club after it was won by Larry Ellison’s giant trimaran, BMW Oracle, in a series against the Swiss defender, Alinghi, in Spain last year. 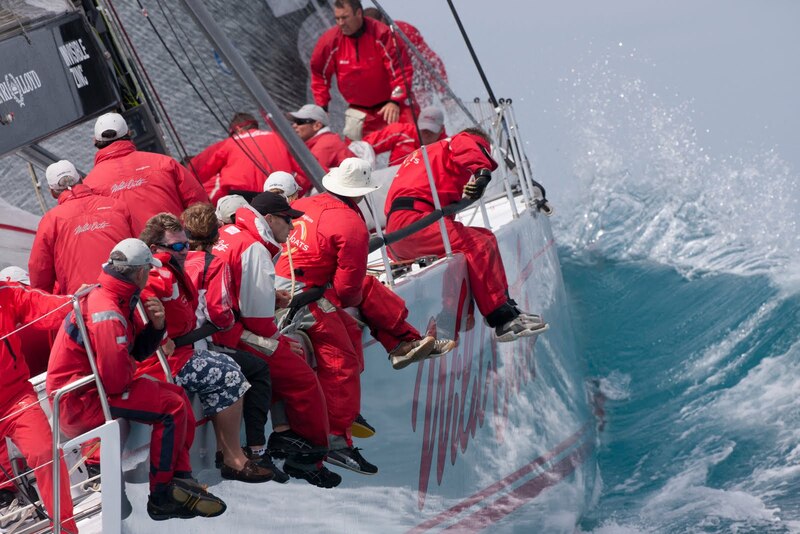 Thirty one year old Australian James Spithill skippered Ellison’s yacht. 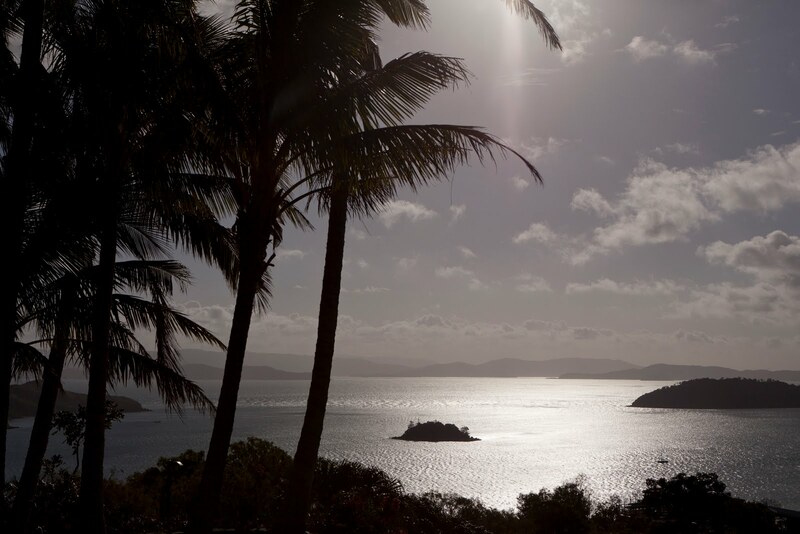 The America’s Cup visit to Audi Hamilton Island Race Week was organised by Iain Murray, the Commodore of Hamilton Island Yacht Club. Murray is also the CEO and Regatta Director for the next America’s Cup match, which will be staged in San Francisco in 2013. Murray’s direct association with the America’s Cup spans almost 30 years. In that time he has been credited with making significant contributions towards the development of the event, particularly through yacht design and development. During Audi Hamilton Island Race Week Iain Murray and the Vice-Commodore of the Golden Gate Yacht Club, Tom Ehman, will be speaking at forums about the America’s Cup as an event, and the exciting new catamarans that will be competing in the 34th match in 2013. 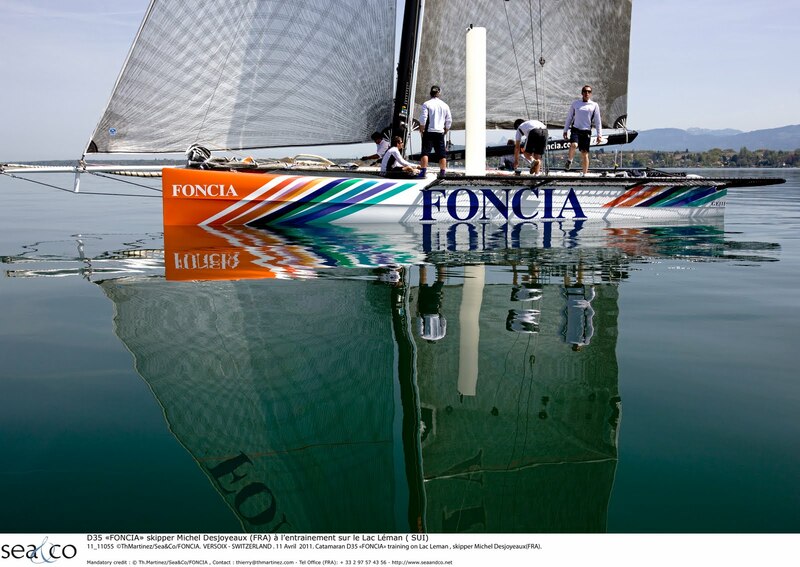 Pas le temps de s’ennuyer pour le Team FONCIA : 15 jours seulement après la mise à l’eau du MOD70, le Vulcain Trophy reprendra ses droits le 1er Septembre. Nouveauté cette année, les deux derniers actes se disputent en Méditerranée. Deux épreuves à courir et une place de leader à confirmer, une fin de saison qui s’annonce passionnante à bord du D35 FONCIA. Cette sixième étape marque un tournant dans le Vulcain Trophy : un retour du multicoque dans l’hexagone qui rappelle également que ce sera le support de prédilection lors des années à venir avec le MOD70. Et pour la première fois de leur carrière, les D35 vont goûter à l’eau salée. Direction les Alpes-Maritimes à Beaulieu-sur-Mer pour ce baptême. Les conditions de navigation en mer s’annoncent ainsi radicalement différentes de celles rencontrées sur le Lac, Michel Desjoyeaux confirme que "cela va être une découverte pour les D35, car ils n’ont jamais vu la mer. Le plan d’eau est plus ouvert, cela laissera un petit peu plus de terrain de jeu. Le problème pourrait venir du Mistral ou d’un coup de vent d’Est qui nous clouerait au port". Une attention plus particulière sera apportée à l’électronique et aux composants mécaniq ues, car l’eau de mer marque en profondeur le bateau. "L’hydraulique et l’électronique vont plus vieillir en deux mois sur un plan d’eau salé qu’en cinq ans sur un plan d’eau douce. Le bateau est en carbone avec des pièces en aluminium ou en inox de haute qualité. Ces matériaux, conjugués à l’eau de mer, forment une véritable pile électrique" ajoute Michel. En fin de navigation il faudra donc rincer à grande eau le bateau et l’équipage pour enlever le sel accumulé tout au long de la journée. Après une ouverture de saison difficile (8e du Grand-Prix Les Ambassadeurs), le Team FONCIA a su trouver les bons réglages pour enchaîner les résultats : quatre podiums, dont deux victoires, lors des cinq épreuves. C’est donc en leaders du classement général provisoire que Michel Desjoyeaux et ses équipiers attaquent cette session méditerranéenne. "Nous n’avons pas de pression sur les épaules, confirme Michel Desjoyeaux, nous allons continuer à fonctionner comme nous l’avons toujours fait. Cela nous a réussis." Si Michel Desjoyeaux a plus l’habitude des embruns salés que ses adversaires suisses, le plateau est relevé et la concurrence ne doit pas être sous-estimée : "Pour moi, la connaissance d’un plan d’eau est complètement anecdotique. Penser connaître c’est oublier d e regarder et c’est là où l’on se fait avoir. Nous n’aurons pas d’avantage par rapport aux équipages suisses. Nous devrons rester concentrés en permanence" prévient Michel. Neuf des onze équipages ont fait le voyage vers le sud de la France, les D35 Ylliam de Pierre-Yves Firmenich et De Rham Sothebys de Philippe Cardis ne participeront pas aux deux dernières manches. Comme prévu depuis le début de la saison, Antoine Gautier cède sa place à bord à Antoine Carraz. 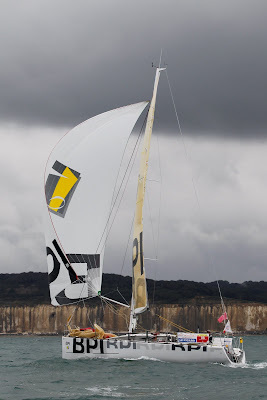 Jusqu’à présent prépar ateur, ce dernier a suivi le Team FONCIA tout au long des Grand Prix et a même embarqué, au pied levé, à bord du catamaran arc-en-ciel lors de la victoire sur la Realstone Cup. Très impliqué au sein de l’équipe, il navigue régulièrement sur de nombreux supports et connaît sur le bout des doigts le D35 FONCIA. Antoine Carraz a d’ores et déjà rejoint Antibes, accompagné de Nicolas de Castro et Alban Rossollin, pour assembler le bateau complètement désossé en juin après le Bol d’Or. Un véritable puzzle avec trois coques, les poutres, le mât, l’accastillage et l’électronique. Si l’assemblage en lui-même ressemble à un "Meccano", le plus gros du travail consistera à remettre le filet en place : "Il y a 300 points de transfilage. Pour démonter il suffit de couper les attaches mais pour le remonter il faudra remettre des garcettes et tendre un par un tous ces points. Un travail long et rébarbatif !" explique Michel Desjoyeaux. Une petite semaine sera nécessaire pour remettre en ordre de marche le D35 FONCIA. Ce monotype suisse est un multicoque de 35 pieds (10,81m). Catamaran à trois coques (la coque centrale n’étant que structurelle et ne touche pas l’eau), c’est un bateau de lac surtoilé avec des échelles latérales qui offre la possibilité aux six équipiers de contrecarrer la puissance développée par le "moteur", i.e. les voiles. La monotypie permet aux concurrents de se battre à armes égales : c’est l’équipage qui fait la différence. Naviguer en D35 était une priorité de la saison pour le Team FONCIA. En attendant la livraison de leur MOD 70, la n ouvelle génération des multicoques et monotypes océaniques, le Vulcain Trophy a permis à Michel Desjoyeaux et ses équipiers de se remettre dans le bain des multicoques face à une concurrence sévère. Jérémie Beyou with the champagne. Image copyright Alexis Courcoux-Jean-Christophe Marmara/Le Figaro. 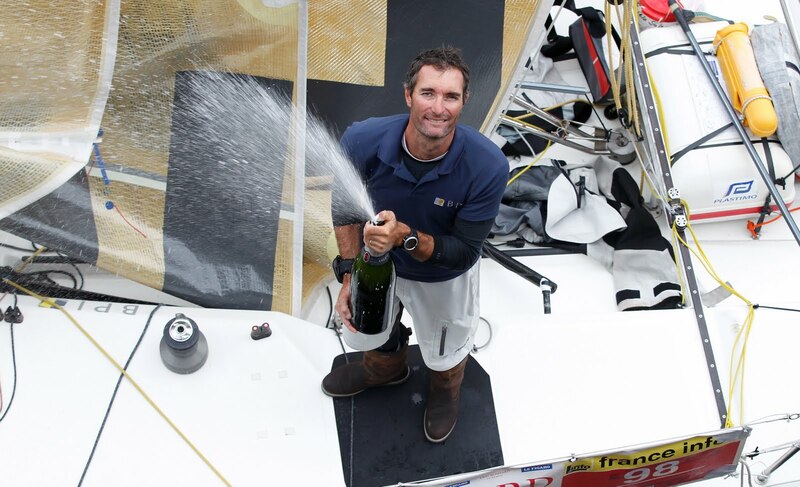 A 35 ans, Jérémie Beyou remporte la Solitaire du Figaro pour la deuxième fois et trois étapes sur quatre. En 2005, il la remportait devant deux anciens vainqueurs, Michel Desjoyeaux et Kito de Pavant. Six ans plus tard, sa victoire est sans appel, après avoir remporté trois étapes sur quatre devant Fabien Delahaye (Port de Caen Ouistreham) et Erwan Tabarly (Nacarat). Les dernières heures ont été terriblement disputées à l'image des douze secondes qui séparent Jérémie Beyou de son dauphin sur cette dernière étape, Paul Meilhat (Macif 2011). "Bien heureux les fêlés, car ils laisseront passer la lumière..." disait Michel Audiard. Il fallait l'être durant cette ultime étape de la Solitaire du Figaro, entre les Sables d'Olonne et Dieppe !!! Jérémie Beyou, Fabien Delahaye, Erwan Tabarly et Paul Meilhat se sont battus comme des chiffonniers, à ne pas se lâcher d'une demi-longueur de bateau. Au final, c'est Jérémie Beyou qui décroche la lune douze secondes devant Paul Meilhat ! Il rentre dans le clan très fermé des doubles vainqueurs de l'épreuve. Cette victoire il la voulait, il la pensait et la préparait depuis trois ans. Lorsque, en 2009, il revenait sur la Solitaire du Figaro après quatre ans d'absence, son objectif était clair : la victoire. Mais en 2009 comme en 2010, même s'il a fait des coups d'éclat (il remporte deux étapes sur quatre en 2009), il manque de préparation. Une Solitaire, ça ne se gagne pas à quelques coups d'entraînements. Cela exige un travail de préparation aussi précis que celui d'un orfèvre. Tout est passé au crible, analysé, optimisé, de la préparation de chaque centimètre du bateau, aux voiles, en passant par l'analyse des conditions météo des éditions précédentes, la préparation physique, l'alimentation et le mental. Jérémie Beyou n'a pas de préparateur mental mais il a préparé cette course depuis si longtemps qu'il est arrivé au départ, extrêmement concentré sur son objectif. Rien ne pouvait le perturber. Aux escales, il était rare de le croiser. Il préférait rester dans sa bulle pour se reposer, étudier l'étape à suivre, ne pas se laisser distraire. Sa course, il l'a préparée au Pôle Finistère Course au Large ainsi qu'avec son préparateur François Guiffant et Christopher Pratt, skipper, qui a décortiqué avec lui les scénarios météo envisageables sur chaque étape. Cette course, il la voulait, il est allé au bout de lui-même, il a été impérial. En 2005, Jérémie Beyou remportait l'épreuve dont le départ était donné de Perros Guirec. En 2011, le départ était donné à ... Perros Guirec. C'est aussi dans cette petite station costarmoricaine que Jérémie a rencontré sa femme et qu'il y passe quelques vacances. Première étape Perros Guirec - Caen : Cinquième à la bouée Radio France devant Perros Guirec, il s'accordait le prix GMF, à Hand Deeps. Après avoir mené l'étape aux avant-postes, il termine 4ème, forcément déçu et déclare : " Durant la nuit, je n'ai pas réussi à mouiller mon ancre pour éviter le courant. Alors j'ai perdu du temps parce que, pendant ce temps, je ne faisais pas marcher le bateau. Je suis tombé dans un trou d'air, on ne voyait pas les nuages, le ciel était bouché, impossible de se placer." Deuxième étape Caen- Dun Laoghaire : Dès le départ de Caen, Jérémie était dans le tempo et maîtrisait parfaitement ses choix de route. Les leaders au classement général changeaient au gré des positions, Jérémie restait toujours à moins d'un mille du leader, n'étant jamais pointé au-delà de la 5è place. L'étape fut rude. Après la traversée de la Manche au près, la flotte progressait au louvoyage le long des côtes britanniques. Il fallait manier la tactique avec aisance pour arriver à Land's End, à la pointe britannique qu'il franchissait en tête. Jérémie ne quittait plus la tête de la flotte et creusait même l'écart peu de temps avant l'arrivée. Il franchissait la ligne d'arrivée en grand vainqueur. Troisième étape Dun Laoghaire - Les Sables d'Olonne : Après un départ mitigé devant le port irlandais, le skipper de BPI choisissait de s'approcher au plus près de la côte pour bénéficier des effets de site. Dans la nuit, il prend le leadership de la flotte pour ne plus le quitter jusqu'à l'arrivée plus de 48 heures et 475 milles plus tard. Jérémie frappe un grand coup et s'octroie la victoire, une fois de plus. Quatrième étape Les Sables d'Olonne - Dieppe : L'étape s'annonce compliquée à gérer. Jérémie caracole en tête avec Fabien Delahaye dès le lendemain du départ. Il franchit le raz de Sein en tête, passe au ras des cailloux, s'octroie le grand prix GMF entre Ouessant et le phare du Four, est toujours en tête au phare de l'île Vierge lundi soir. A chaque zone de transition, il gagne quelques longueurs. La nuit est fatigante, à louvoyer dans les cailloux et dans la brume. Après un passage ralenti sous l'île de Guernesey et le raz Blanchard, ils forment un groupe de quatre avec Fabien, Erwan Tabarly (Nacarat) et Paul Meilhat et se marquent. Aucun d'eux ne veut rien lâcher, ils ont tous autant la niaque. L'un pour remporter l'étape, l'autre pour s'assurer une place sur le podium de la course. C'est une petite manoeuvre, un empannage qui permettent à Jérémie Beyou de franchir la ligne en tête, 12 secondes devant Paul Meilhat (Macif). Au classement général, Jérémie augmente encore un peu l'avance qu'il avait sur Fabien Delahaye de quelques secondes, 34 minutes et 43 secondes au final. Jérémie Beyou en route. Image copyright Alexis Courcoux-Jean-Christophe Marmara/Le Figaro. La dernière étape : "A la fin, c'était une super petite régate. Paul a empanné un peu trop loin. Et puis voilà ! J'ai bien géré, il faut un peu de réussite aussi. Toute la nuit c'était un peu longuet. Il y avait du marquage sur Fabien, je n'ai jamais été trop inquiet. A la fin je me suis dit que Fabien ce serait plus propre s'il était derrière. Il m'aurait battu 2 fois (il a remporté la première étape), je l'aurais battu 2 fois, voilà. Ca fait un peu cour de récré mais bon ! Et puis je me suis dit que ce serait bien que Fabien soit derrière alors je me suis rapproché de Paul, le vent est rentré un peu par derrière et on est revenu un peu sur Macif et à un moment tu te dis c'est bon, la Solitaire c'est dans la poche, une régate gagnée, ça a fait tilt. Je n'y pensais pas du tout à cette victoire d'étape et puis avec la réussite, j'ai beaucoup de chance. L a première partie de l'étape, je l'ai vraiment faite à ma main. Fabien était dans les mêmes parages que moi. Mais j'étais le premier à virer, le premier à aller à la côte au Four (Chenal du Four ndlr), le premier à aller vers la bascule en Manche. Quand ca a commencé à prendre feu sous Guernesey, je me suis dit qu'il était temps que je sois observateur." La course : "Cette victoire, il faut que j'en profite, que je savoure. Tout était facile. Quand tout le schéma stratégique est très clair dans la tête, tu as une bonne vitesse, et ça fonctionne. (..) C'est un enchaînement de choses. Je me suis toujours dit qu'il y avait une méthode pour gagner à chaque fois. Il faut prendre en main sa façon de naviguer, ne jamais subir." La Solitaire du Figaro : "C'est un truc de fou, un truc génial. C'est une ambiance sur l'eau, à terre, que tu ne connais nul part ailleurs. Des gens comme Claire de Crépy à terre, Jacques Caraës, le Docteur Chauve en mer, c'est de l'or en barres. Cette course est extraordinaire, c'est MA course préférée. Il y a des courses plus prestigieuses, différentes mais celle-là, c'est MA course de coeur." La concurrence : "C'est intéressant de savoir ce que pensent les autres, l'influence que j'ai sur l'eau ...L'avenir sourira à Fabien Delahaye. Il est vraiment très bien, il va vraiment très vite. Je savais qu'il allait plus vite au portant. Je n'ai pas joué les gros bras, j'ai fait du gagne petit. Il a gagné une étape, il est tout jeune, comme Paul Meilhat. Ce n'est pas facile de revenir les battre, ils sont vraiment forts ; ce n'était pas évident de revenir et de dire, je vais gagner la Solitaire du Figaro. En 2009, quand j'ai dit à Claude Paoli que je voulais revenir, c'était des mots mais il y avait un paquet de boulot pour arriver à ça. Je suis vraiment super fier de ça, revenir pour gagner et arriver à gagner ! Ca restera une fierté." Le Vendée Globe : "Ce serait vraiment pas de bol de ne pas être au Vendée Globe parce que j'ai la niaque pour bien faire, je sais bien faire, ça mettra un peu de spectacle sur l'eau. Il ne manque plus que le ou les partenaires et je ferai aussi bien que sur la Solitaire du Figaro en 2012 "
Claude Paoli, Présidente de BPI : "Il a de l'élégance". En 2009, Jérémie portait les couleurs de Bernard Paoli sur la Solitaire du Figaro. Claude Paoli, sa femme, et ses enfants avaient décidé de soutenir amicalement et personnellement Jérémie Beyou, pour commémorer la disparition de leur mari et père. L'année suivante, Claude Paoli était toujours présente aux côtés de Jérémie qui portait alors les couleurs de BPI, tout comme cette année. Jérémie aura offert à Claude Paoli, à sa famille et à ses collaborateurs, le plus beau des remerciements ... et de l'émotion, beaucoup d'émotion. Claude Paoli : "Je laisse aux experts parler des qualités de marin de Jérémie. Le mot qui va le mieux à Jérémie c'est Elégant. Il a de l'élégance dans sa relation à son sponsor : la façon dont il parle de nous, la façon dont il dit "Je me suis arraché pour mon partenaire". Ce soutien à Jérémie, je le vois comme un tremplin pour qu'il trouve un partenaire plus important parce que nous n'avons pas les moyens de le suivre plus loin. En interne, tous les collaborateurs sont très très fiers et très excités par cette fin de course ! Il est formidable, tout le monde est ébloui." Les eaux de la baie de Morlaix doivent posséder des vertus insoupçonnées. Aujourd'hui, c'est Jérémie Beyou, enfant du pays, qui entre dans le cercle très fermé des doubles vainqueurs de la Solitaire du Figaro. C'est ici qu'il a appris à naviguer sur ce bassin où la multitude des têtes de roches empêche d'envisager de mouiller un parcours de régate orthodoxe, où les courants suivent parfois des itinéraires peu recommandables. C'est ici qu'il a fait ses premières armes en dériveur puis sur les bateaux des aînés, tel son père ou Yvon Quillec chef d'entreprise et régatier insatiable qui embarquait des jeunots à la pelle sur des voiliers de course apprêtés comme des jeunes filles de jour de leur premier bal ou encore Bruno Jourdren qui porta le premier les couleurs de Carantec dans le monde de la voile professionnelle. La baie de Morlaix est un terreau qu'il faut savoir faire fructifier : Jérémie Beyou n'a eu de cesse, tout au long de sa carrière, de porter toujours un peu plus haut la barre de ses exigences. Il a vingt ans tout juste quand il débarque sur le circuit Figaro, tout en continuant de mener des études au sein d'une école de commerce. La voile n'en est qu'au tout début de la professionnalisation ; en vivre est encore une gageure. Petit à petit, le jeune homme franchit les paliers qui l'amèneront à cette année 2005 où il rafle tout : Champion de France en Solitaire, il remporte l'ensemble des épreuves du circuit, y compris la mythique Solitaire du Figaro. De 1997 année de ses débuts, à 2005, il a déjà glané un titre de Champion de France, accédé plusieurs fois au podium de la Solitaire du Figaro. Son triomphe est donc tout, sauf une surprise. La victoire de 2011 n'est pas que celle d'un doublé réservé à une poignée de coureurs. C'est aussi celle de l'achèvement d'une métamorphose. En 2005, quand il avait emporté le grand chelem, Jérémie Beyou se devait de combattre perpétuellement de vieux démons. Lui, le navigateur exigeant avec lui-même, perfectionniste jusqu'au bout des ongles, n'avait de cesse de s'inquiéter d'un revers de fortune improbable, au point de donner le sentiment qu'il en gâchait une part de son plaisir. Pourtant, la victoire appelant d'autres ambitions, c'est somme toute assez logiquement, qu'il envisageait de partir sur le Vendée Globe 2008-2009. Mais parfois le chat noir décide de vous mettre des bâtons dans les safrans. C'est tout d'abord, une Route du Rhum qui se termine avant même d'avoir pu entrer dans le vif du sujet. Des raisons familiales impérieuses mettent fin à l'expérience. Certains, dans le petit monde qui gravite autour de la course au large ont vite fait de brûler les idoles qu'ils ont vénérées. Abandonner une course pour des raisons privées est un bon moyen de donner prise à des rumeurs parfois peu amicales. Pour Jérémie, la blessure est vive, même s'il ne regrette à aucun moment sa décision. Par la suite, deux démâtages dans la Barcelona World Race puis dans le Vendée Globe, conjoints d'un contexte économique difficile, auront finalement raison de la volonté de son partenaire de continuer l'aventure. Paradoxalement, c'est peut-être là que Jérémie Beyou a trouvé la force de rebondir. En embarquant en 2009 aux côtés de Michel Desjoyeaux, il y découvre que l'on peut associer une féroce envie de gagner et une certaine décontraction. Il multiplie les expériences entre le monocoque de Michel et le trimaran géant de Pascal Bidégorry. Il affiche dès lors une joie de vivre et une sérénité nouvelle qui va se manifester dès l'été 2009, quand avec la seule aide d'une famille mécène, il enquille deux étapes de la Solitaire du Figaro, et devient un candidat plus que crédible à la victoire finale. Jérémie a aussi cette capacité à se remettre en question, à engranger les expériences, à reconnaître ce qu'il doit aux autres. Alors, si Jérémie avoue encore qu'une certaine dose de souffrance peut être parfois un ressort essentiel pour la gagne, il laisse maintenant transparaître une sérénité nouvelle, celle d'un homme qui a su digérer ses échecs pour en tirer les enseignements. Quand on a touché le fond, et que l'on sait rebondir, on porte forcément un autre regard sur les petites contrariétés qu'amène fatalement une compétition aussi acharnée que la Solitaire du Figaro. « Si je suis repris après avoir été longtemps devant, je ne gamberge plus. Je sais que c'est comme çà, qu'il faut en remettre une couche, c'est tout... » Le compétiteur implacable est toujours présent, mais il dispose maintenant d'une confiance renforcée dans ses capacités... Après tout, c'est peut-être ça, l'état de grâce. Fondé en 1984, BPI est aujourd'hui une entreprise d'envergure internationale présente dans 40 pays et forte de 1800 collaborateurs. Spécialisé dans la préparation, la mise en œuvre et le pilotage des stratégies de changement de ses clients, entreprises et institutions, BPI a la conviction que le progrès durable ne peut résulter que d'une étroite combinaison entre deux facteurs : l'économique et l'humain. « La création de BPI est fondée sur l'idée que lorsque des questions humaines sont en jeu, il n'existe pas de solutions « prêt-à-porter »viables dans la durée. Notre objectif est d'aider nos clients à dessiner leur développement, à optimiser leurs performances, à organiser les conditions de restructuration et de croissance, à franchir avec succès le cap des décisions difficiles », Claude Paoli, Président directeur général BPI. The podium. Image copyright Alexis Courcoux-Jean-Christophe Marmara/Le Figaro. 1 98 BEYOU Jérémie BPI Arrivé en 257h08'41"
2 4 DELAHAYE Fabien PORT DE CAEN OUISTREHAM + 34'43"
3 3 TABARLY Erwan NACARAT + 01h07'59"
4 9 LUNVEN Nicolas GENERALI + 01h11'21"
5 190 ROUXEL Thomas BRETAGNE-CREDIT MUTUEL PERFORMANCE + 01h22'06"
6 79 MEILHAT Paul MACIF 2011 + 01h35'47"
7 ± 92 CHABAGNY Thierry GEDIMAT + 01h46'49"
8 * 192 LAGRAVIERE Morgan VENDEE + 01h48'39"
9 31 PELLECUER Laurent ATELIER D'ARCHITECTURE JEAN PIERRE MONIER + 01h48'56"
10 8 MARCHAND Anthony BRETAGNE-CREDIT MUTUEL ESPOIR + 01h56'13"
11 10 ATTANASIO Romain SAVEOL + 02h10'14"
12 * ± 70 MACAIRE Xavier STARTER ACTIVE BRIDGE + 02h14'29"
13 ± 60 DUTHIL Frédéric SEPALUMIC + 02h30'37"
14 32 HARDY Adrien AGIR Recouvrement + 02h30'58"
15 68 NICOL Jean-Pierre BERNARD CONTROLS + 02h31'21"
16 28 LOISON Alexis Port Chantereyne Cherbourg-Octeville + 02h37'45"
17 5 GREGOIRE Jeanne BANQUE POPULAIRE + 02h40'47"
18 * ± 57 SHARP Phil The Spirit of Independence + 02h42'51"
19 ± 66 JOSCHKE Isabelle Galettes Saint Michel + 02h55'50"
20 48 SVILARICH Etienne Volkswagen Think Blue + 03h10'12"
21 * 26 RUYANT Thomas DESTINATION DUNKERQUE + 03h37'43"
22 64 JOSSIER Nicolas Entreprendre en Pays Granvillais + 04h10'09"
23 96 DROUGLAZET Eric LUISINA + 04h24'06"
24 * 34 DALIN Charlie Keopsys + 04h24'32"
25 17 GOUEZIGOUX Laurent VALORISONS + 04h39'11"
26 ± 16 RICHOMME Yoann DLBC + 04h47'15"
27 6 PERON Eric MACIF 2009 + 04h49'03"
28 72 BIARNES Vincent PRATI'BÛCHES + 04h55'12"
29 2 MORVAN Gildas CERCLE VERT + 05h05'12"
30 ± 11 MONNET Jean-Charles PARIS 15 - Château Peyrat Fourthon + 05h49'26"
31 * ± 59 HUMPHREYS Conrad DMS + 06h14'57"
32 88 RIVET Frédéric VENDEE 1 + 06h46'44"
33 ± 13 MOUREN Jean-Paul GROUPE SNEF + 08h22'34"
34 * ± 23 GOODCHILD Sam Artemis + 09h36'33"
35 95 BOTHUON Michel LES RECYCLEURS BRETONS + 10h18'15"
36 85 LOBATO Francisco ROFF + 10h40'29"
37 93 KING Nigel E-Line Orthodontics + 11h12'42"
38 30 EMIG Marc ENSEMBLE AUTOUR DU MONDE + 11h13'42"
39 * 45 LITTOZ-BARITEL Alexis SAVOIE MONT-BLANC + 11h50'22"
40 * ± 36 PICAULT Sébastien KICKERS + 13h22'50"
41 ± 67 LIVORY Yannig ONE NETWORK ENERGIES + 16h03'04"